The Rohloff Chain Tensioner is a spring loaded device that maintains chain tension in a single driveline application. It should be used with the Rohloff Speedhub 500/14 when horizontal adjustment of the hub is unattainable or in rear suspension applications where the distance between the bottom bracket and the rear axle change throughout the range of travel. The Rohloff Chain Tensioner is an excellent choice for any conversion to a single driveline system (i.e. Speedhub 500/14 or singlespeed). 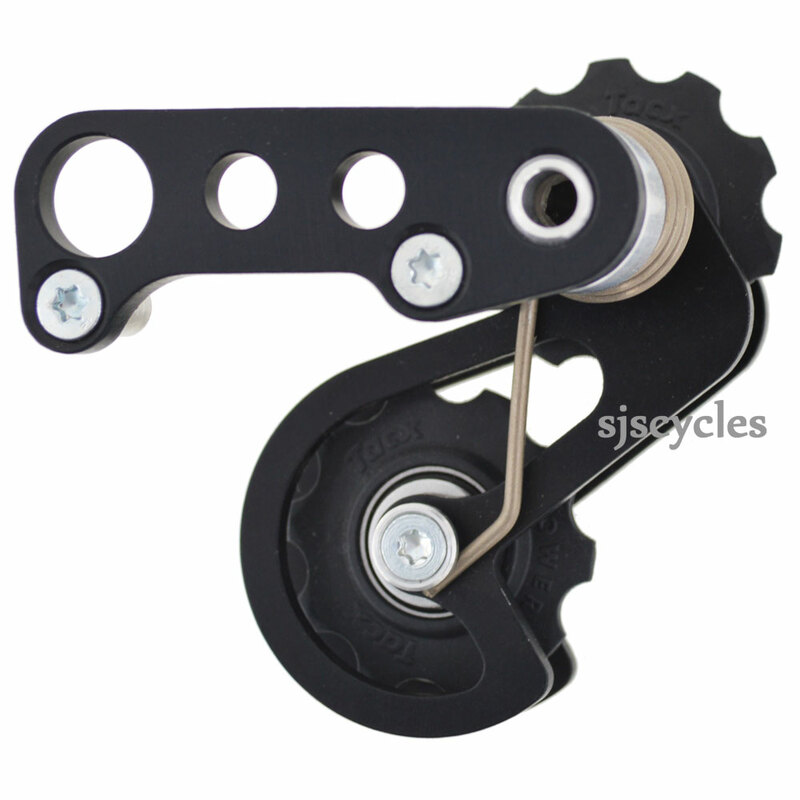 The Rohloff Chain Tensioner is easy to install, it simply mounts to the existing derailleur hanger of the frame. Spacers are used for lateral adjustability. For the quick wheel removal the Rohloff Chain Tensioner swings back when pulling the wheel of the dropouts. The Rohloff Chain Tensioner has a tensioning capacity of 10 chain links which is sufficient even for long travel rear suspensions. On dropouts thinner the 7mm, the use of the 13 sprocket and all splined sprockets (chainline 58mm) will require the use of the longer mounting bolt. This is available seperately. Hello. I'm looking at swapping my Rohloff hubgear from my GT 29er (which has an eccentric BB) over to my 2009 Dawes Ultra Galaxy. Can you tell me, should I be looking at the 8250-10 tensioner or the 8250, please? You simply need the standard 8250 tensioner.